The delicate anise flavor of Vanns Tarragon shines in this recipe for a classic dressing, lightened up with the use of Greek yogurt, tossed with a salad as crisp and green as the dressing itself. If you love the flavor of tarragon, but don't love how quickly it wilts in the fridge, this recipe is for you. Vanns Tarragon keeps its delicate flavor but lasts much longer on the shelf, removing the time-sensitivity of this dressing, so that you can put this dressing together any time you like, without having to source the sometimes hard-to-find herb at its center. This dressing also makes a wonderful dip for crudites, and a topping for just about any kind of crunchy, fresh salad, though the suggested recipe below helps to accentuate its crisp, green flavor. To make the dressing, combine anchovies, yogurt, mayonnaise, parsley, basil, lemon juice, garlic, and cayenne in the bowl of a blender and process until smooth. Transfer to a container and stir in tarragon and chives. Season to taste with salt and pepper and refrigerate for at least 1 hour to allow flavors to meld. To make the salad, cook edamame according to package directions and rinse under cold water to cool. Drain. Bring a pot of salted water to boil and add snap peas or green beans. Bring water back to a simmer and cook for 2 minutes. Drain and rinse under cold water to cool. 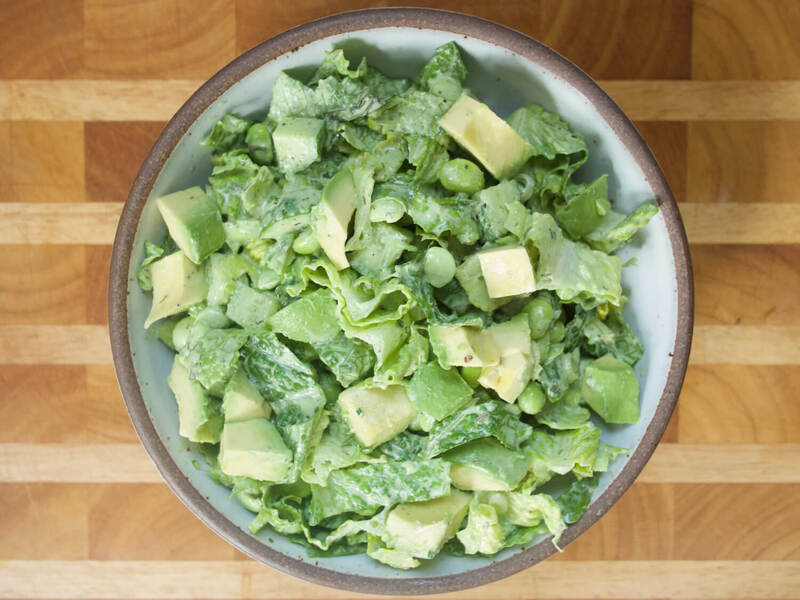 Combine all salad ingredients in a large bowl and pour over half of the dressing. Toss to combine, adding more dressing as desired. Salad should be generously coated with dressing, but not swimming in it. Serves 4 as a main, 6-8 as a side salad. Adapted from Repertoire. A quick shirmp dish that builds flavor through the use of Asian aromatics, earthy turmeric, and spicy chili flakes. Combined with a refreshing slaw, it just needs a side of rice to make a complete meal. Maybe you have your grilling recipes all set for this weekend. Maybe you're letting someone else do the grilling. Either way, don't forget about the sides! This coleslaw hits all the right notes. Vanns Sichuan Peppercorns add a spicy twist to cumin-scented lamb meatballs, counterbalanced with a cooling cucumber salad. A lighter take on a taco salad, featuring ground turkey spiced with Vanns Taco Seasoning, and a homemade pico de gallo salsa. This dish is like spanakopita, if it were made by a Greek grandmother. Chopped greens, fragrant herbs, salty feta, and dried Mediterranean Oregano and Aleppo-Style Pepper are enveloped in a thin and tender homemade phyllo dough. These falafel sandwiches are straight-up amazing. The falafel is flavorful, crisp, and light, so good that even by itself it’s a wonderful thing. Coleslaw isn't the only kind of cabbage salad out there - grilling wedges of cabbage before drizzling them with a vinaigrette spiked with smoky, spicy Vanns Chipotle Chili Powder reveals an entirely new side to this versatile vegetable.